The replacement car for the Chevy rear engine, air cooled Corvair built from 1960-69 was the Chevrolet Vega built from 1970-77. 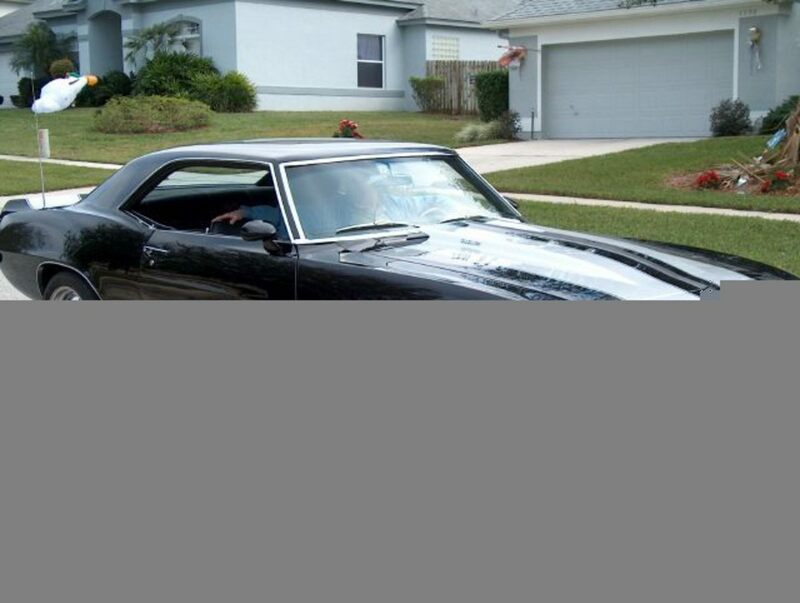 The design began around 1968 and used an all aluminum engine in the front. The Corvair used a partially all aluminum engine. Both cars were sub-compact economy cars, although both ended up as performance cars demanded by the public. 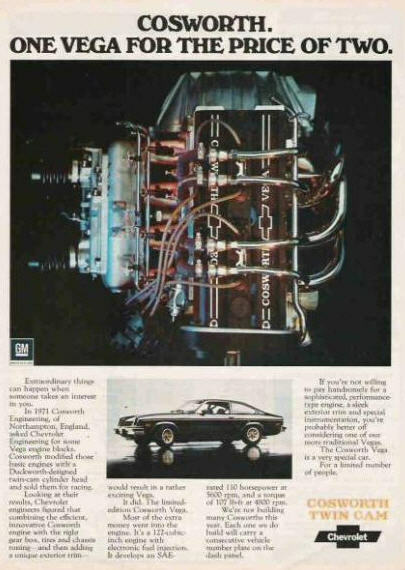 The Corvair had its performance model, the Corsa, with either a 180 or 140 hp engine, made only in 1965-66 (although the 140hp engine was sold in the Monza to 69). 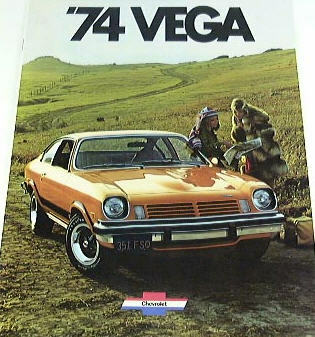 The Vega had its performance model, the Coswell. Its engines ranged from 75 to 85 hp. The Corvair Monza had a 110 hp. The styling of both attracted the buyers, both won Car of the Year (Corvair twice), and Chevy marketed both two different audiences. 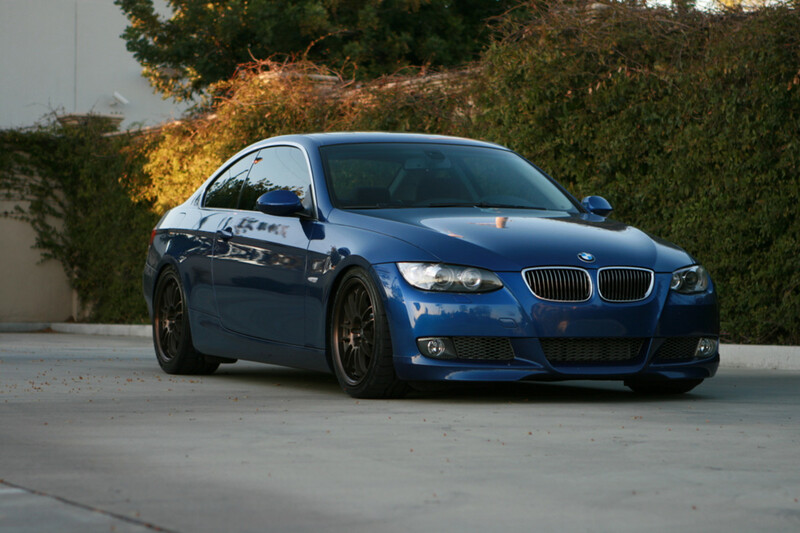 Those who wanted practical and economical cars and those who wanted a sport car. Because of their styling, the general public then and today thought they were designed to be a muscele sport car. Not so. 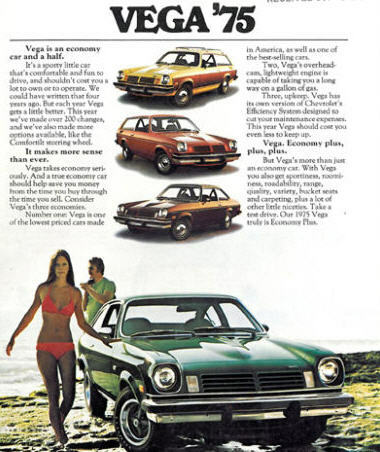 The Vega was always only a sub-compact economy car, as was the Corvair. The market and times demanded that a sport version also be created (Coswell and Corsa). 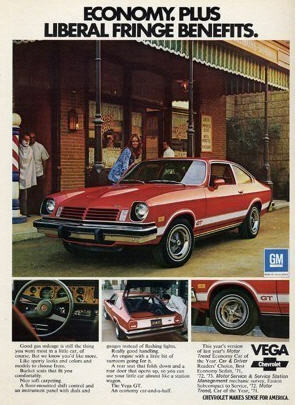 The Vega GT was a cheaper version of the Coswell (which cost over $5000, nearly the price of a Corvette). 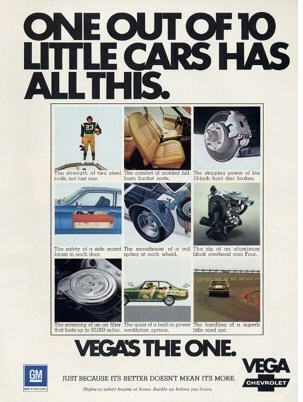 The Vega ads all promote that 60s muscele car heritage, yet always reminded the reader that Vega meant economy. 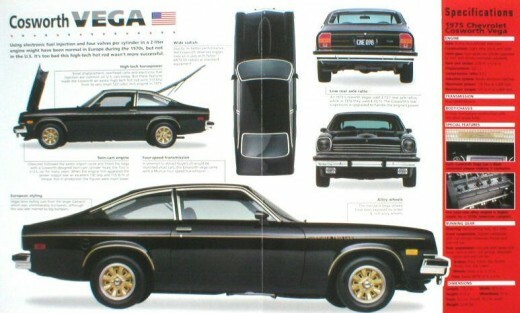 The Vega is a classic 70s car, full of plastic and molded interior, plaid seats and simply weird color schemes except in the GT and Coswell models.The Achilles heel for Vega was its all aluminum engine which meant that after 50,000 miles, the engine head would crack etc. By the time Chevy had rectified the issue, the public lost confidence in the car. Sales plummeted. 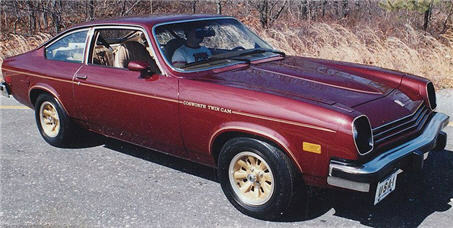 The Pontiac version, Astre, looked identical but Pontiac used a non-aluminum engine. 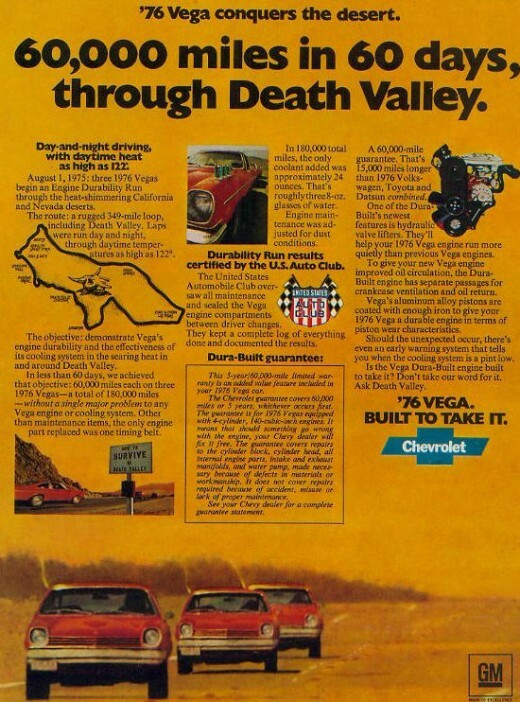 Today, Vega is still either loved or hated, just like the Corvair. Parts are plentiful on ebay. 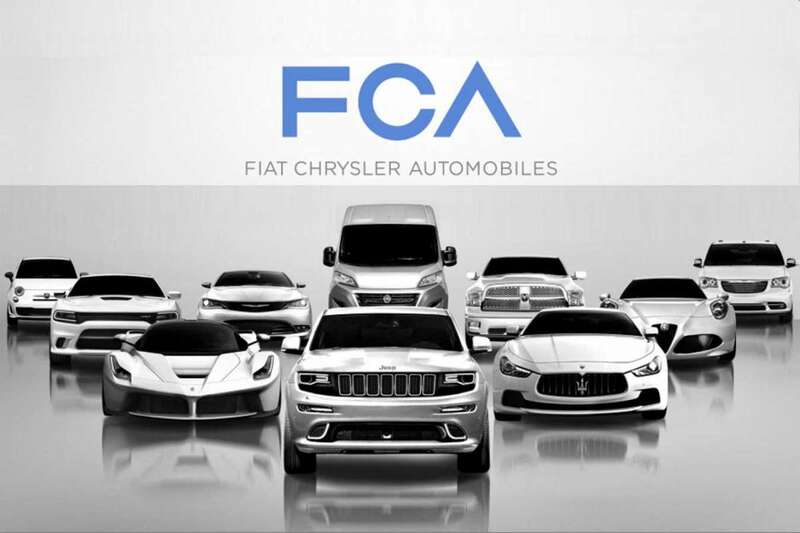 Corvair has a much stronger following and more than 100,000 remain on the road today. 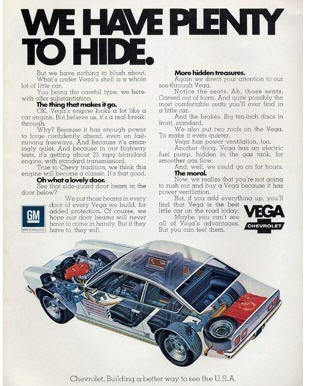 Vega's collector value remains low, even for a car that is in VG condition, not more than $3000 tops. A Cosworth fares better at around $5000. Compare this to a Corvair in VG, and Corvairs are worth several thousand more. A Corsa in VG condition can fetch $10K. 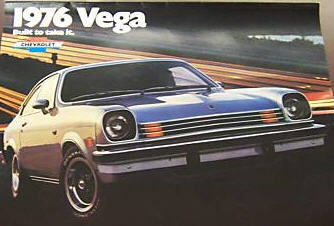 The vega actually looks better in the ads than in real life, IMO. 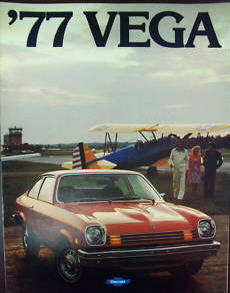 Link to Chevy Vega Group for an album of 28 Vega ads with ALL to be posted soon. A great historical perspective - thanks.